This is a story of a different style of camp, a camp with a purpose. It is a story from someone who is not at the coalface but is in a back room situation. 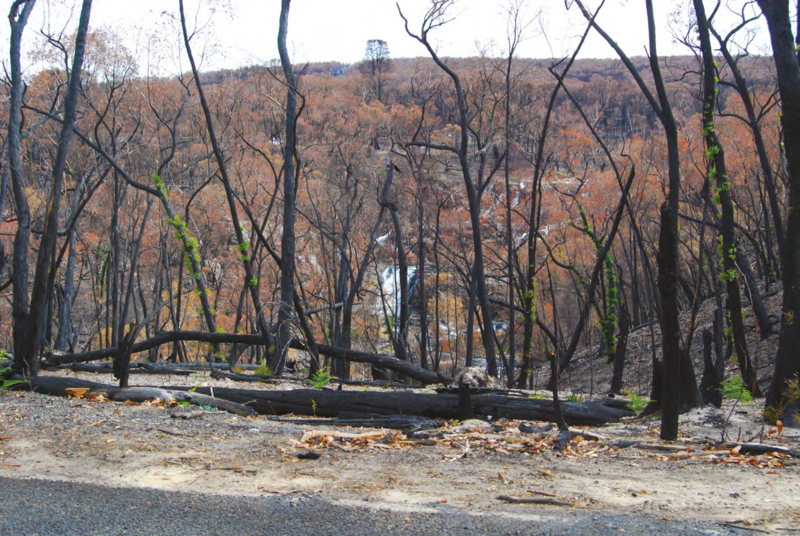 Hark back to the devastating bushfires in the Northern Grampians region in January 2014. 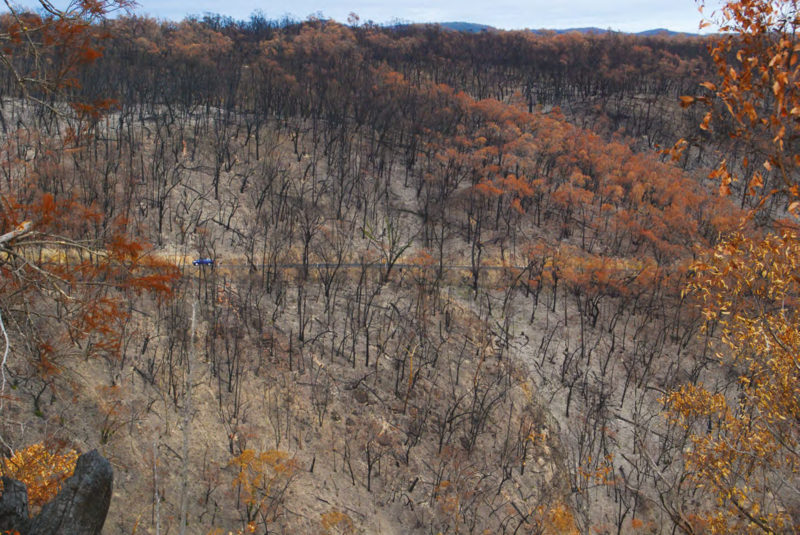 The fires sadly took one life, destroyed in excess of 27 homes, as well as sheds and outbuildings, 55,000 hectares of land, many kilometres of fencing and countless wildlife and stock. Into this devastation and despair comes the BlazeAid Crew. The BlazeAiders are volunteers (mostly from the grey nomad brigade) who give of their time to help the farmers regain some sort of normality from within their blackened environment by assisting with the re-fencing of their farms. Without fences the farmers have no way of containing their remaining stock and of carrying out basic animal husbandry. They also have no way of keeping out wildlife. On February 5, the first BlazeAiders went out to assist farmers with their fences, repairing where possible, and eventually erecting new fencing. Back at camp, exhausted and blackened, they had a feeling of having achieved something good. The logistics of setting up such a camp is a bit different. BlazeAid works alongside the community and local council. A suitable camp is identified – in the case of the Northern Grampians this is at Laharum. All that is here is a sports field, small club house, some tennis and netball courts and a couple of sheds. There is no town, no houses, no shops and most importantly no pub, etc. About a kilometre down the road is a hall and primary school/kindergarten and that’s it. Laharum is about 30km from Horsham and is on the western side of the northern Grampians. From this site a camp comes into being and becomes home for many. For the BlazeAiders this means using your motorhome, campervan, caravan, tent or fifth wheeler as your home. All meals are provided with the community groups usually providing the evening meal which is always a main course and a desert. 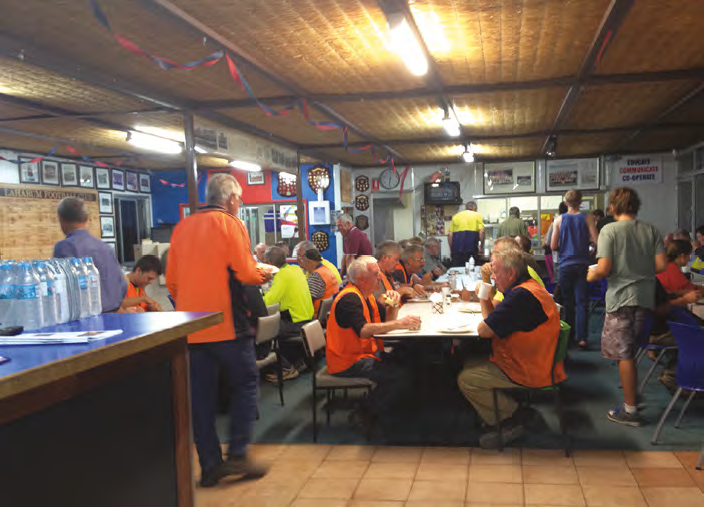 Breakfast would put many a hotel buffet to shame and smoko and lunch is generally either provided by the farmer if he is able – he may not have a house remaining after the fires – or the BlazeAiders pack their own lunch from provisions provided by the ancillary crew. Most mornings it means getting up from 5.30 onwards with breakfast served at 6.30 and muster at 7am. Crews then prepare for the day’s work and collect the tools required for the job they are going to. For the ancillary crew work commences with the preparation for breakfast and the packed lunch ingredients being laid out. Once the crews are on their way the ancillary crew clean up the dining area and kitchen, vacuum and mop floors and clean the amenities. Administration crew record the data associated with running a camp such as this. A BlazeAid coordinator is in control of the whole camp and liaises with the community, farmers, council and the BlazeAiders. While crews are out assisting farmers the ancillary crew must keep the camp stocked with supplies, keep the tools and equipment in top condition, carry out repairs where necessary and do anything else the camp requires. In rotation, various local community groups provide evening meals at 6.30pm. Examples of such groups are the Rotarians, Apex, Lions, CFA, Men’s Shed, local farming ladies and social clubs. BlazeAid is not good for the diet, though. The evening meals in many cases are good home-style meals such as roasts with all the trimmings – somehow a leg of lamb from the farm tastes so much better than from the supermarket – casseroles, fish and chips, barbecues or schnitzels. The sweets are crumbles of all sorts: trifles, chocolate ripple cake, sticky date pudding or pavlovas. Muster follows the evening meal and this is where the crews report back on what they have achieved for the day and who they have helped. If it has been a special day of helping out a particularly badly affected farmer this will be recounted. It is then time to go to bed and start again at 5.30am for another day. Many affected farmers just do not know where to start with getting on with life. BlazeAiders go into some very sad situations but generally at the end of day one there is a turnaround in the demeanour of the farmer and he sees hope. Farmers are a proud breed and the need for help is not always acknowledged by them so sometimes it is a difficult path the BlazeAiders tread. This is a very good human trait to have. A BlazeAid camp is very much dependent upon the local community and local councils. It is the community that makes a camp work, for without such a commitment a campsite will generally not be available, there will be no meals provided, there will be no initial introduction into the community in which BlazeAid wishes to work. The local council also needs to play a big role in providing assistance for the camp. The community here at Laharum is very closely knit and has great leaders. We only have to say we need some more water, a generator, a cool room or a shipping container, etc. and somehow it is sourced for us. The community here seems to know exactly where to pull the right strings and it must be commended for that. If you point that out to people they always reply with comments such as ‘but you are doing so much for us and we don’t know how to thank you’, or ‘you are doing so much to help rebuild our community and it is us that must thank you’. We always thank the volunteer organisation for providing our lovely meal, yet invariably someone from that organisation will respond and say ‘it is not you who should be thanking us but we who should be thanking you for what you are doing for our community’. This is very humbling from a volunteer point of view but is also very gratifying to know that the time you are giving to assist others is appreciated. Somehow it makes you feel you are getting something out of the experience as well. That is not the initial intention when you volunteer your time to assist. You came to help out a fellow Aussie in need but gain a lifetime experience and a warm and fuzzy feeling. There is a small primary school just down the road and the children did some drawings for BlazeAid that were presented to us as a thank you. This was also special. I have not really been on the receiving end of this type of accolade before and it makes you want to help even more. BlazeAid is also a generator of income within the local community, in this case Horsham. We source all our grocery supplies, equipment, tools, repairs and fuel locally. It is not only BlazeAid the corporation that does this but also the BlazeAiders who, on days off, need to do shopping, have haircuts, use a laundrette, buy fuel, papers, books, magazines, repairs or have scripts filled. One fellow BlazeAider came back from a day in Horsham saying that he was $300 lighter in his pocket. Considering we have had more than 240 BlazeAiders so far come through this camp that is potentially a lot of money left in town to circulate. If you have never considered doing something like this can I just say that not only is it very rewarding – you learn so much about people – but it is so very humbling. Why not give it a try.